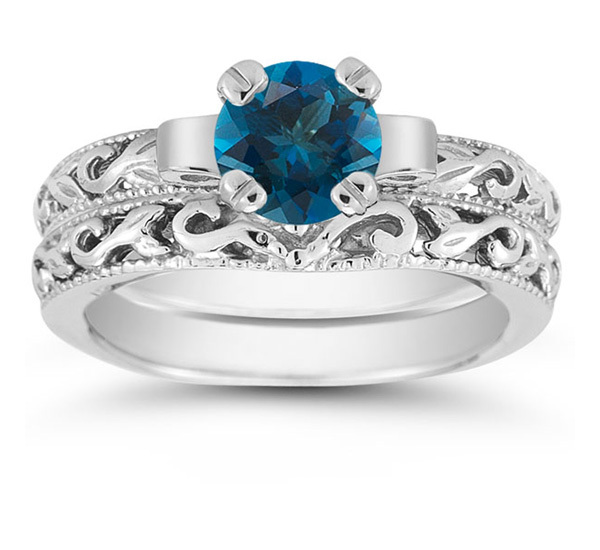 A bold blue color shakes up the standard bridal ring set in all the right ways. This Apples of Gold creation uses a splendid London blue topaz gemstone to add a punch of azure color that any bride craves. The 6mm gemstone still brings a radiant shine in the perfectly crafted sterling silver setting. The bands, also of gleaming sterling silver, feature specific art deco details to keep this bridal ring set not only stylish but sophisticated, too. We guarantee our London Blue Topaz 1 Carat Bridal Set in Sterling Silver to be high quality, authentic jewelry, as described above.